Part your hair on top of your head. If your hair is dry, then apply hair conditioner through your hair to eliminate frizz. 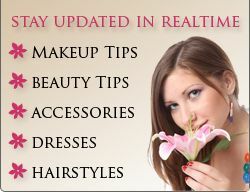 If you are going to salon then make sure to get an appointment at least 15 days in advance. Get a picture of the hairstyle you want. You can find many hairstyle pictures on the internet. Communicate with the stylist and make sure that there are no confusions. For dressing when going to a salon try a button down shirt so you that your hair don’t get messed up when you go to get dressed for the main event.